As construction on the three block stretch of North Higgins grinds towards completion the final character the street will assume is slowly coming into view. The question is… “will this ultimately create a safer environment for everyone and help to promote business downtown?” I sure hope so… I personally think this is a great project, one that is much needed along this stretch of Higgins with the ever increasing popularity of the Farmer’s Markets. Saturday mornings in downtown are becoming almost unbearable with the number of people frequenting the Saturday Markets… maybe City Council should outlaw those ridiculously huge baby strollers to help alleviate foot traffic… I would hate to see the carnage caused by a three stroller pile-up. Anyway, foot traffic downtown has certainly increased to the point where giving over more space along this stretch of road makes sense. 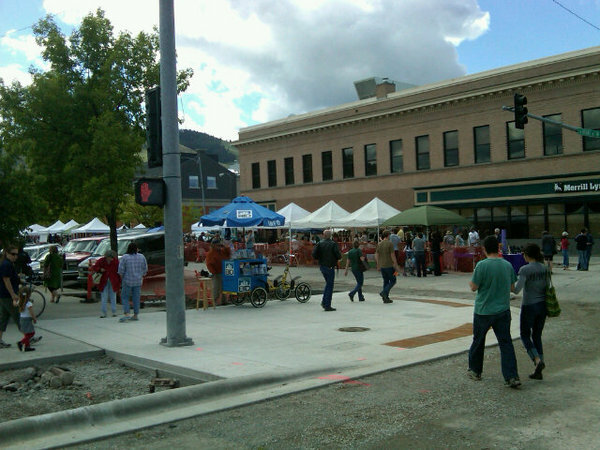 A decade ago the Farmer’s Market was respectable, but I would venture to guess that visitors have increased by a factor of three or four over the last decade… especially with the success of the Clark Fork Market. The North Higgins Streetscape is well ahead of schedule thanks to economic stimulus money. Originally the idea of downtown business owners and the BID, and first proposed in Greater Downtown Master Plan, the project is meant to create a more inviting, calm, and safe urban environment for pedestrians and cyclists along this often congested downtown corridor… encouraging people to spend more time – and thus money – downtown. Pedestrians have already had ample opportunity to test out and benefit from the extra real-estate given over to them as the series of bulb-outs have been finished for some time. While the curb-extensions work well at creating a safe pedestrian environment, at this moment I’m skeptical of the other half of the project… the new, integrated cycle-tracks seen below (in their unfinished state). “…We’re going to see continuing job loss, even as the economy is beginning to stabilize.” –President Obama speaking at Macomb Community College in Warren Michigan this afternoon. I see this as the ultimate oxymoronic statement. I daresay that for those hundreds of thousands of people who are losing their jobs this month, and the millions more unemployed by year’s end, that the economy is doing anything but “stabilizing.” Of course, maybe if you are a stockholder or employee of Goldman Sachs, and reporting record profits since 2007, things are looking pretty rosy right about now. And nice news blurb during a break during the Sotomayor hearings. Only one person arrested so far today, as best as I can tell.